The Portner Flats apartment building once dominated the low rise residential intersection of 15th and U Street, and when it was completed in 1902, it was crowned as Washington’s largest apartment building. Completed in three stages beginning in 1897, it was located on the northeast corner, with a main façade extending 320 feet north to V Street. Built by millionaire brewer Robert Portner and designed by architect Clement Didden, construction of the first of three phases began in 1897 at the intersection of 15th and U Street. Portner had purchased the land for $45,000, and had formed the Capitol Construction Company to build it to avoid union disputes during the project. Skeptics coined it “Portner’s Folly” due to its location far from the urban center of town. However, the first section of luxury, three bedroom apartments rented quickly, and Portner commenced building a northern wing at 15th and V Streets in 1899. Incredibly, with only one vacant apartment remaining in the two sections, work began on the middle section in 1901. It was built one story taller than the previous sections, and in a slightly more Romanesque style that was popular at the time. It featured a large, two story balcony in the central penthouse. The middle section was built atop a swimming pool and tennis court that was one of the more unusual features for an apartment complex at the time. Unlike the large apartments built earlier, the central section contained a series of smaller efficiencies and one bedroom units. To make up for the loss of the pool and courts, only a few years after they were built, Portner included large ballrooms, a huge dining room and private rooms that renters could reserve for parties. The entire complex cost an estimated $350,000 and contained a total of 123 apartments with 515 individual rooms. 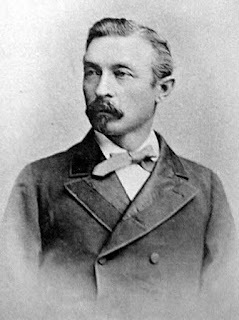 In addition to the Portner Flats, Clement August Didden (1837-1923) was architect of a significant number of homes in the immediate area, but curiously never received much national recognition. Born on May 13, 1837 in Brakel, Germany, Didden left Germany in 1862 for England and the Cape of Good Hope to practice architecture. He moved to New York City in 1866 to work for Fernbach, Hunt, and Post, a firm with prominent architect Richard Morris Hunt. After leaving New York in 1870 or 1871, Didden became affiliated with the influential Philadelphia firm of Fraser, Furness, and Hewitt. He worked in Philadelphia until 1872 when he moved to Washington and eventually established his own practice. Didden is attributed with numerous residential designs within the area, including 1207-1219 Q Street, 1609-1615 13th Street, 1329-1335 N Street, 1223-1229 15th Street, 1520 to 1524 Kingman Place, 1604-1606 Vermont Avenue, 1224 13th Street, and 1453-1455 Massachusetts Avenue, N.W. Didden's career as architect in Washington lasted for nearly 50 years. He lived most of his life at 710 13th Street, N.W. At the age of 86, in 1923, Didden died leaving behind works in Washington, Philadelphia, New York, South Africa, England, and Germany. His relative George Didden III is President of the National Capitol Bank on Capitol Hill. Robert Portner (1837-1909) had arrived in the port of New York in 1853 from Westphalia, Prussia, where he had been born just sixteen years earlier. He became a citizen in 1859 and proudly voted for Abraham Lincoln in 1860. As a risk taker, Portner decided to take his small savings and settle in Alexandria in the late spring of 1861, where he opened a grocery store. Selling goods to commanders for the army stationed throughout the area proved to be a huge success, and within a year, Portner bought a small brewery, from which he then sold beer to the armed forces. Expanding the brewery naturally followed, and soon he was renting a schooner to ship goods and beer down the Potomac to soldiers stationed in nearby Fredericksburg. With a staff of five, he quickly expanded to produce 1,000 barrels of Tivoli beer, making deliveries to local pubs in and around Alexandria. Tivoli is “I lov it” spelled backwards. In the next ten years, Portner continued to expand the brewery, built an ice plant, bought a shipyard, started a construction company, and established a German-speaking bank while also dabbling in real estate. In 1880, Portner and Edward Eils invented a cooling device that used a steam-driven fan to force air over refrigerated pipes that is recognized as one of the earliest air conditioning inventions. By 1895, the brewery extended over four blocks on either side of Pendleton Street between North Street, Asaph and North Washington Streets. Portner and an investor formed the National Brewing Company at 13th and D Streets, Kentucky and South Carolina Avenues, NE. The Main building was 135 feet tall, 94 feet wide and 137 feet deep with stables and a huge icehouse, which produced 50 tons of ice per day. The brewery produced 100,000 barrels of beer annually, or 24 million pints a year. Portner and his family lived at an estate in Manassas coined ‘Annaburg.’ Its grounds included a dairy, deer park and a man-made lake, complete with swans. When he died in 1906, Portner's estate was worth $1.9 million. Portner’s life and legacy is the subject of a book titled The Shortest Dynasty: 1837-1947 by Michael Gaines. The author chronicles the fascinating events of the Portner family, their trials and triumphs, and provides in-depth look into the brewery business and the many innovations that Portner helped create. Portner’s Lager beer is today now made by the Old Dominion Brewing Company. Portner’s son, Paul V. Portner, began a real estate company in 1910, and lived at the Portner Apartment building for some time. He purchased and rented houses in the area, including 1750 and 1752 Swann Street. He died of complications from excessive drinking in 1919, at the age of 36. The Portner family sold the apartments to investors in 1945. It reopened the Dunbar Hotel, after a massive, $800,000 reconfiguration of the 123 apartments into 485 hotel rooms. Incompetent management led to a liquor license suspension in 1950, at a time when the hotel was renting to prostitutes and vagrants. In the years following, the building was transformed again, and became Washington’s leading elite black hotel, welcoming entertainers playing on U Street. Named after LeDroit park resident and literary figure Paul Lawrence Dunbar, it remained a popular gathering place for debutante balls, weddings, and musical performances. The Dunbar slowly declined after the city’s other hotels were integrated, and partially closed its doors in 1964. It was sold to the city in 1970, and remained vacant for four years, and despite the efforts of preservationists, it was razed in 1974. In 1978, the Campbell-Heights apartment complex was built on the site, with a seven story high rise building and low rise garden apartments.